The first one is a classic, Revlon's Super Lustrous lipstick in Fire and Ice is a bright red that has the slightest orange undertone to it a true statement lip. I find reds with a warmer undertone to be a bit more complementary to skin tones all across the board and this is no exception. This instantly brightens up my whole complexion and is such a fun red to wear. Since the formula is on the creamy side, definitely pair it up with a lip liner so it doesn't smear off anywhere. This product ranges anywhere from $4.99 to $6.99 at drugstores. The next bold red is Rimmel's Show Off Lip Lacquer in Big Bang. This is probably my most favorite red I own since it is probably one of the truest reds that doesn't lean to cool or too warm. These liquid lipsticks are extremely pigmented with a nice shiny gloss effect when applied. I did a full review of these guys here when I first got them. This color is still a favorite and the name is fitting since this red does make a big bang statement! This lasts quite long but can transfer easily so if you wear it out, always keep it in your bag for touch ups along with a mirror! This product is $4.99 at the drugstore. For something a bit deeper with a little more pink and on the matte side, my choice would have to be NYX Cosmetic's Soft Matte Lip Cream in Monte Carlo. This color is more of a berry red but is still gorgeous for this time of year when you want to wear a red but not something too red. The formula is one of my favorites for a matte product and lasts all night. It is still a statement lip without being too bold or too dark. You can usually find them for BOGO 50% off too but they usually cost only around $5.99 at drugstores or Ulta. For something a bit deeper, I have another NYX Cosmetics product, the High Voltage Lipstick in Bordeaux. The name matches this color perfectly since this is a nice deep red wine color that is highly pigmented. I also did a review of this earlier this year here. As I mentioned before in my review, this product is a bit difficult to work since it is Soo creamy and smooth, but the color is so beautiful that I am willing to take my time and work with it. Definitely use a primer and a liner to keep it from moving-you can even set it if you want on top though you may lose some of the shine. Another NYX lippie that costs $5.99. Lastly, the deepest shade on my list that isn't overly dark is this deeper wine color from the Maybelline Creamy Matte lipstick in Divine Wine. The formula is indeed creamy and not drying for a matte. It wears well and the color lasts for a good amount of time. I'd say this is more of a satin finish than a true matte but that's besides the point. The color is what I'm about and for those who love a vampier look without being too dramatic, this is the perfect shade, especially if you still want to be festive for the holidays. I'd say this is my second favorite out of this list and because the formula is so comfortable to wear with lasting power, this is another one I'd wear out more often. This ranges from $5.99 to $7.99 at drugstores. I hope you guys enjoyed this post! I love a good red lip whether it is a true red or something deeper and I hope you guys are inspired to wear red or try out red for the holidays! Readers, what are your favorite drugstore brands? 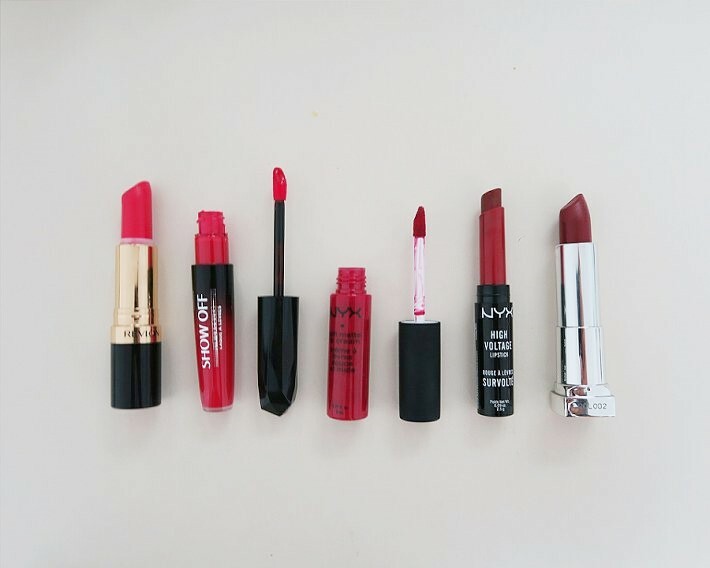 What's your favorite red lippy? Let me know! If you are looking for a solid contextual advertising company, I recommend you take a peek at PropellerAds.